Smoothie bowls are everywhere now – you can’t go on Instagram without having one of them jump at you. So naturally I hated them. When I see something exploding – I start not liking it. This happened with chia seeds and quinoa and it’s still true for me for kale, spirulina, matcha, cauliflower sauces and all those other bowls that are in right now. So yeah, I hated smoothie bowls. They did look pretty. But did they look tasty? Not really – to me they looked like someone put a lot of effort to assemble something that would taste like nothing. On top the vivid image of me slurping a smoothie like a 90 year old did not seem appealing. Then last week it was really hot and I needed something delicious, but also healthy to cool off. A week back I had made a frozen banana ice cream (another thing everyone’s crazy about and that I’ve hated on for years, without even trying it) – it turned out to be exactly what I thought it would be – gross. I didn’t have a choice but to make a smoothie bowl now. Luckily I had also some of my now beloved chia seeds soaked overnight. Pair that with berries and banana and change your perspective. I must say – I’m glad I made that smoothie bowl. It’s amazing: it’s cooling, delicious, sweet enough and just perfect for summer. I can’t believe how healthy this super quick, easy and refreshing recipe is. I now understand why everyone loves smoothie bowls – not overrated after all. I slurped away and was not ashamed at all. With some peanut butter in it, life can’t get better. 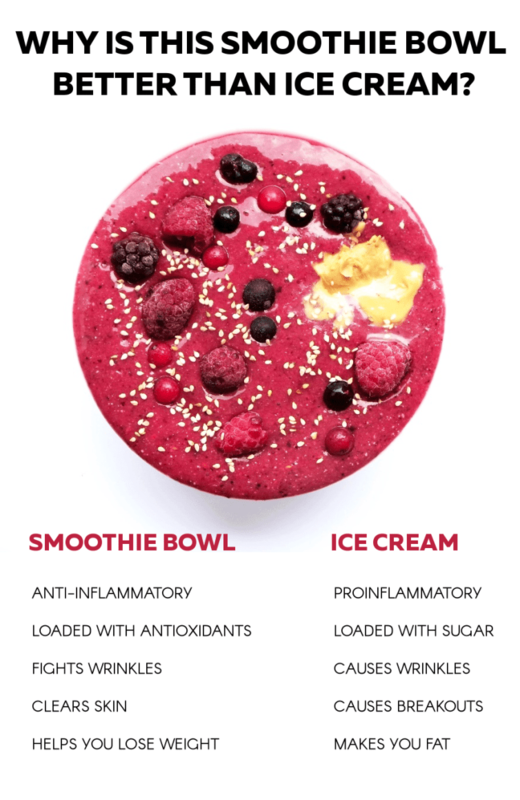 Hope you decide to make this smoothie bowl (or another one) and see for yourself if it is a good choice for you as well. Let chia seeds soak overnight in water. 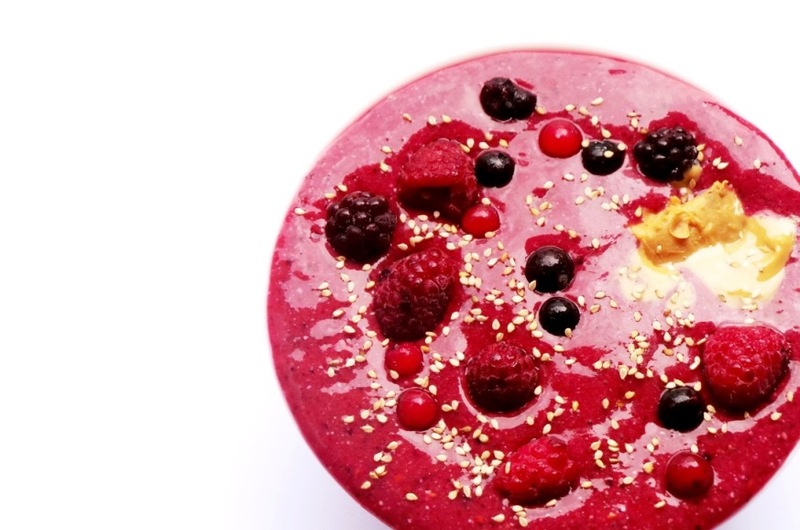 In your food processor – add banana, chia and berries and blend. There should be enough fluid for you to blend like this, if not add some water (about 1/3 cup) just to get it all started. Pour into a bowl and top with berries, sesame seeds and peanut butter.